outside the door as is the pool. Beach is open and few if any others even at the peak of the season. A brand new clubhouse opened in 2010 with complete exercise facilities, party room with media center, patio deck with barbeque. Exercise facility includes free weights and machines, treadmills, elipticals and stair machine. appliances and everything to cook and entertain. 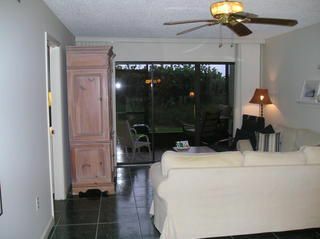 Amenities include two televisions, a DVD player, CD stereo, washer and dryer and dishwasher. Tastefully furnished with canopy bed in master bedroom and twin beds that can convert to a king in second bedroom. Fully equipped modern kitchen to cook and entertain. We thoroughly enjoyed our stay here. It was a home away from home. It had everything we needed and then some. The owners were wonderful and pleasant to work with. Would definitely stay here again. Our time was up too fast and it was sad to leave. But had a truly pleasant stay. from the condo. Gazebo at entrance to beach . Excellent fishing on the beach in front of condo. fun. Great shelling and sea glass collecting. Boat rentals available on Huthinson Island as well. 2 hour drive to Orlando makes Disney World and other amusement centers a day trip.